This is a fascinating initiative by Ariel and BlogAdda to promote men also taking on the chore of washing. In my case I have been washing my own clothes since I was in Class Eight in School and it is nothing novel or unique for me. I wash my clothes every weekend and then spend time ironing the clothes. 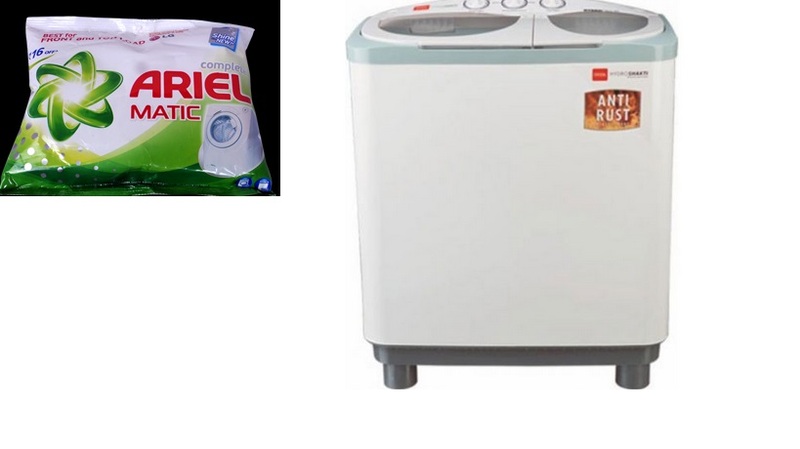 This post narrates the ironical twists when I attempted to take pics of myself, the washing machine and the Ariel packet that I received. After adding the powder, water and clothes within the machine, I attempted to position myself to click a proper picture on my phone. I use a phone which has no front-facing camera and I have to use my wits to take a selfie with the rear camera. For the sake of the rules and instructions I have taken pics from the Internet, no copy-righted images no cyber-bullying please. The washing machine is the same model as the one that I have at home. Share the load my dear brothers, uncles, and members of the male clan. Help your family-members was the clothes, with Ariel’s super fragrance, powerful chemical stain removers, washing clothes will be a breeze and not something to worry about. I am a regular user of Tide detergent for as long as I can remember, Ariel gave me a chance to try something different and I am happy with the results of the clothes being washed well. The phone will be back from the service centre in a few days and my fingers are crossed! But let us focus on the main topic here. Washing is not a gender-specific job, wash your clothes – #ShareTheLoad. I still feel it is idiotic to expect the woman of the house to wash the clothes of the entire family. With most modern families having both the husband and wife working and leading a busy life in the tough cities across the country; washing becomes a weekend job. The washing machine and dryer come to the rescue of families. So help your partner wash the clothes. Share the task, spread love and see the smiles and warmth that overflows.